Even when the study was initially announced, there were numerous issues. For example, Séralini attempted to force reporters to sign a non-disclosure agreement when the study was first being released, a move that was described as an “outrageous abuse of the embargo system.” We can only guess at to his reasoning for making this demand, but one of those guesses is that the data was so bad he wanted to mute criticism. Things #1-10. It was retracted. [infobox icon=”quote-left”]The journal Food and Chemical Toxicology retracts the article “Long term toxicity of a Roundup herbicide and a Roundup-tolerant genetically modified maize,” which was published in this journal in November 2012. This retraction comes after a thorough and time-consuming analysis of the published article and the data it reports, along with an investigation into the peer-review behind the article. The Editor in-Chief deferred making any public statements regarding this article until this investigation was complete, and the authors were notified of the findings. Very shortly after the publication of this article, the journal received Letters to the Editor expressing concerns about the validity of the findings it described, the proper use of animals, and even allegations of fraud. Many of these letters called upon the editors of the journal to retract the paper. According to the journal’s standard practice, these letters, as well as the letters in support of the findings, were published along with a response from the authors. Due to the nature of the concerns raised about this paper, the Editor-in-Chief examined all aspects of the peer review process and requested permission from the corresponding author to review the raw data. The request to view raw data is not often made; however, it is in accordance with the journal’s policy that authors of submitted manuscripts must be willing to provide the original data if so requested. The corresponding author agreed and supplied all material that was requested by the Editor-in-Chief. The Editor-in-Chief wishes to acknowledge the co-operation of the corresponding author in this matter, and commends him for his commitment to the scientific process. Unequivocally, the Editor-in-Chief found no evidence of fraud or intentional misrepresentation of the data. However, there is a legitimate cause for concern regarding both the number of animals in each study group and the particular strain selected. The low number of animals had been identified as a cause for concern during the initial review process, but the peer review decision ultimately weighed that the work still had merit despite this limitation. A more in-depth look at the raw data revealed that no definitive conclusions can be reached with this small sample size regarding the role of either NK603 or glyphosate in regards to overall mortality or tumor incidence. Given the known high incidence of tumors in the Sprague-Dawley rat, normal variability cannot be excluded as the cause of the higher mortality and incidence observed in the treated groups. Ultimately, the results presented (while not incorrect) are inconclusive, and therefore do not reach the threshold of publication for Food and Chemical Toxicology. The peer review process is not perfect, but it does work. The journal is committed to getting the peer-review process right, and at times, expediency might be sacrificed for being as thorough as possible. The time-consuming nature is, at times, required in fairness to both the authors and readers. Likewise, the Letters to the Editor, both pro and con, serve as a post-publication peer-review. The back and forth between the readers and the author has a useful and valuable place in our scientific dialog. The Editor-in-Chief, A. Wallace Hayes, did not state that Séralini attempted to defraud the public (or science), though his study design and misuse of data is troubling (and more so, that a respected journal published it and to only realize the low quality of data after a year of withering criticism). This is in contrast to one of the more renowned scientific swindlers, Mr. Andy Wakefield whose fraudulent paper alleging a connection between MMR and autism which was retracted by the Lancet specifically because of that fraud. Though the difference between Wakefield and Séralini is somewhat like splitting hairs. GMWatch used the Monsanto Shill Gambit by claiming that “Hayes’ decision to retract the paper follows FCT’s (Food and Chemical Toxicology) appointment of Richard E. Goodman, a former Monsanto scientist and an affiliate of the GMO industry-funded group, the International Life Sciences Institute, to the specially created post of associate editor for biotechnology at the journal, early this year.” Because real scientists who did real scientific research at Monsanto were infected with the immorality and anti-ethics virus. Obviously, GMWatch’s own ethics are for sale, because they impose that belief on others. Most of us just saw the article for the bad science it was, unlike GMWatch who apparently doesn’t care about science, but just propaganda for their pseudoscience. GMWatch concluded its screed against Hayes with “in a highly irregular process, Hayes now contradicts the outcome of the peer review and editorial process and decides to retract the paper over a year after it was published. His decision is not made on the basis of new data, but on a secret and non-transparent review by unnamed persons, who evidently do not feel able to stand behind their decision publicly or disclose any conflicts of interest they may have.” It is NOT an irregular process. Sometimes the peer-review process doesn’t work as well as it should (and no one in real science thinks anything is perfect, including peer-review). Reals science makes errors, and it must be self-correcting, especially when the article being retracted was so poorly done. Sorry GMWatch, but your knowledge of science is so poor, you don’t understand this. Once again, there is little evidence that GM crops pose any danger to human beings. And now that little evidence has fallen by one, even though most of us thought it was so poorly done that we would laugh hysterically if anyone brought it up in a discussion. At least with the retraction, we can just dismiss it without wasting words describing why it was so bad. But more importantly, the scientific consensus is that GM crops are safe. Science has been studying cancer for a long time, and it has come to a few conclusions. One of which is that there are precious few ways to prevent cancer, and avoiding GMOs is not one of them. Animal research only rarely provides us with proper evidence of human clinical conclusions. Around 90% of animal studies ever amount to anything clinically. Animal research is actually near the bottom of the hierarchy of good clinical research. And finally, Séralini’s research that concluded that GMOs cause cancer was poorly designed, overhyped, and ultimately retracted by the scientific journal that published it. This study was a waste of time. Just like Wakefield. Editor’s note – This article was originally published in November 2013. 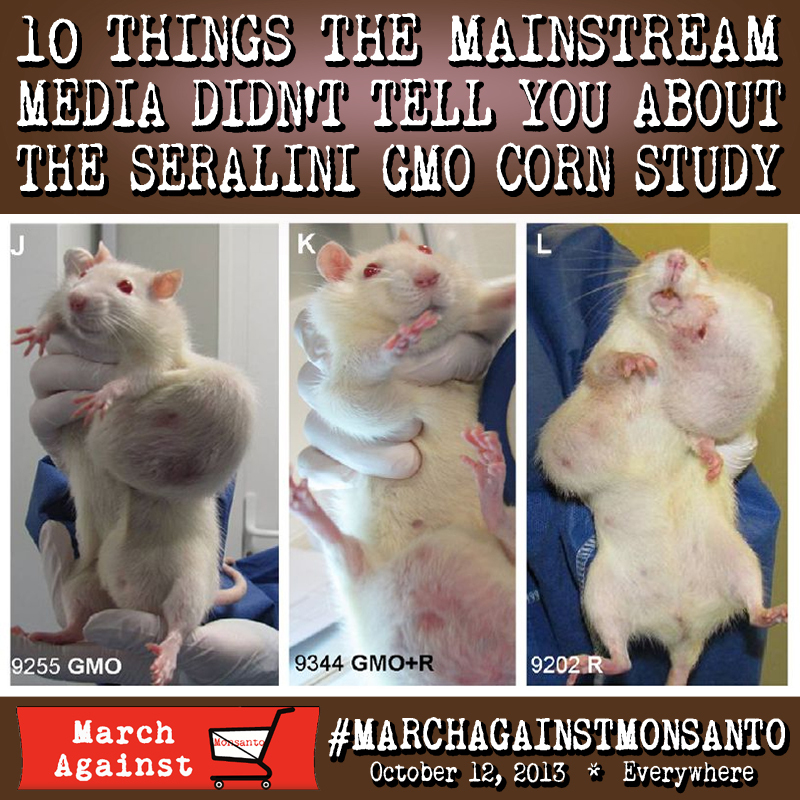 Obviously, it’s old news, and anyone who knows anything about GMOs already has heard that this study was retracted, and Séralini is kind of a pariah in science. However, as with most anti-science tropes, they never really die, and this Séralini study has reappeared on the internet. I will deal with this complex court decision in an upcoming article. Nevertheless, I’m republishing this article in case someone needs to deal with misinformation from GMO activists.